Not just one poster for you, but two! I've been working hard recently, so here are some of the fruits from my fruit basket of labour. 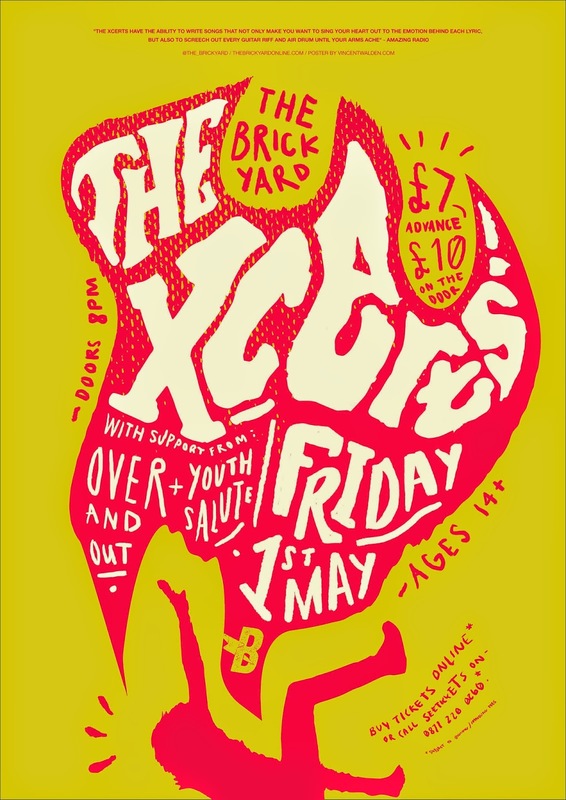 These past weeks I've been really feeling the vibe of the 'classic look' to gig posters, with that DIY sort of handwritten style. 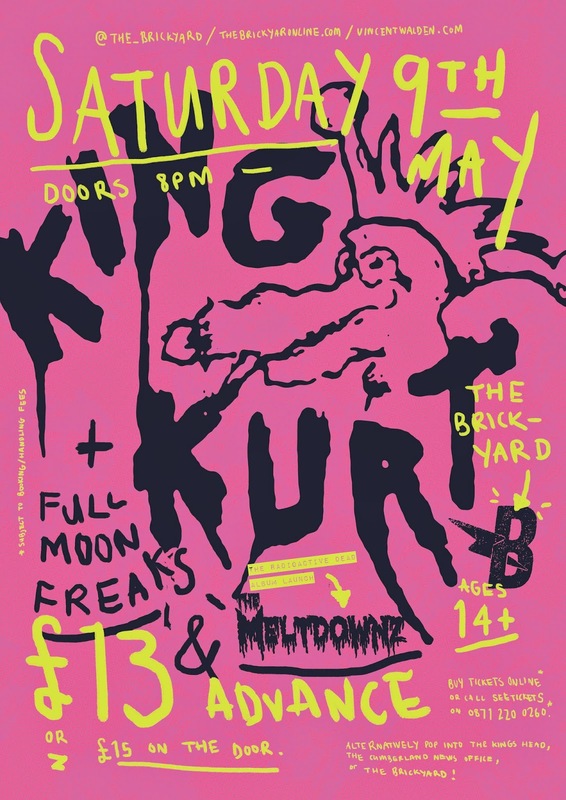 So first this week, I did the King Kurt poster, which is a sort of Punk aesthetic – because to me that's what their music and past design seemed to embody. For the colours, I pretty much just stole the palette from one of their albums. Firstly because it's a highly recognisable colour palette, but also because it's a brilliant one at that. Then I cracked out the graphics tablet, got a nice brush and went to town, changing i it, erasing it and pretty much trying to rush it; but all the while making it legible and clear. The band have a fun, and easy going mantra about them, which is what I wanted to reflect with the naive handwriting and punk style. As it stands, any poster I've done with my own handwriting was hugely fun, but deadly awkward. Oh I do like a bit of pink. Now to move on to an Xcert of the next poster. Looking at it now, it kind of looks like I used the same colours. just inverted. But honestly, I didn't, they were just a happy accident of a miss-click. When I saw The Xcerts be announced, I did as I normal do; find out whether there is already someone doing the poster, and if there isn't—mock up some tests. For this, I noticed the tour was on the back of their album launch, so I saved an image of their album and stole the falling person from it's main image; once vectorised, I made a range of shapes to correspond to it, and the best one looked like this. 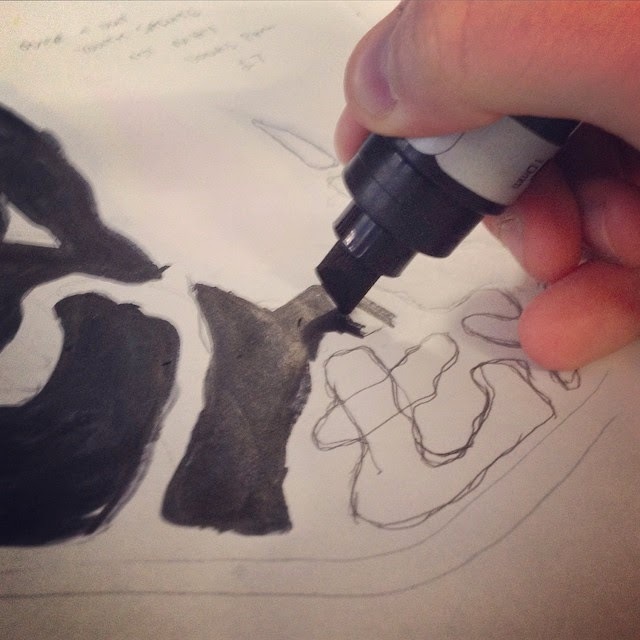 Once I had a shape I liked, I grabbed my mega marker and embraced my current passion—HAND RENDERED TYPE! This was by far the most fun part, especially when you have the freedom that the lovely guys at The Brickyard give me. There is something really cathartic and empowering about using a marker pen the size of your head, and it made it even better that I could just make what I wanted, and as long as it made sense and looked good, ye' olde' Mark Howlette would give the big thumbs up. So I went for it. I won't go too far into the details but I really like this poster and it will definitely go down in the history of one of my favourite posters I ever made. It kind of reminds me of starburst sweets. As a final note, it's a little unnecessary and will likely go unseen, but I'd just like to thank The Brickyard for allowing me the chance to do all the posters I have—and also Mark Howlettterttretre as he leaves their company to flutter on around France buying old chairs and such like. Thanks guys. Ben's Otter is even better now. 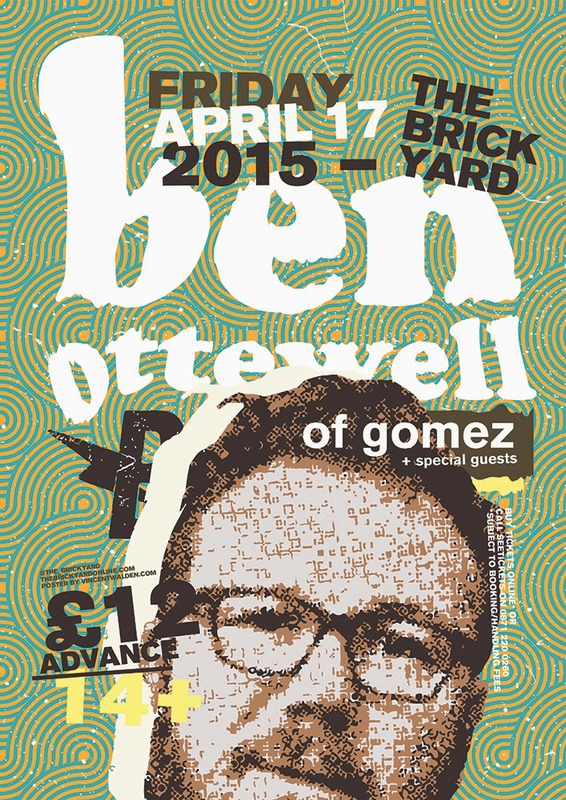 As you may have seen, I made a quick knock up poster for the up and coming Ben Ottewell gig—but that was only ever temporary as it was needed to be done quickly to show at a busy gig. Since doing that the poster was sent to the people of Ben Ottewell and Gomez and they came back with that they couldn't see enough of his face. So if they wanted his face, that's what they were getting. I vectorised his face, skewed the text and covered it all in the a pattern of blue and yellow. I looked at it and thought I needed to add some more rustic and earthy colours, so I threw all that together and somehow – through a few hours of trail and error I made this lovely poster; of which I really rather like. A decline in success with a successful declination. Figure that out. So for the past two weeks I've been working on two projects side by side – two branding projects, one for a photography conference and another for a charity. 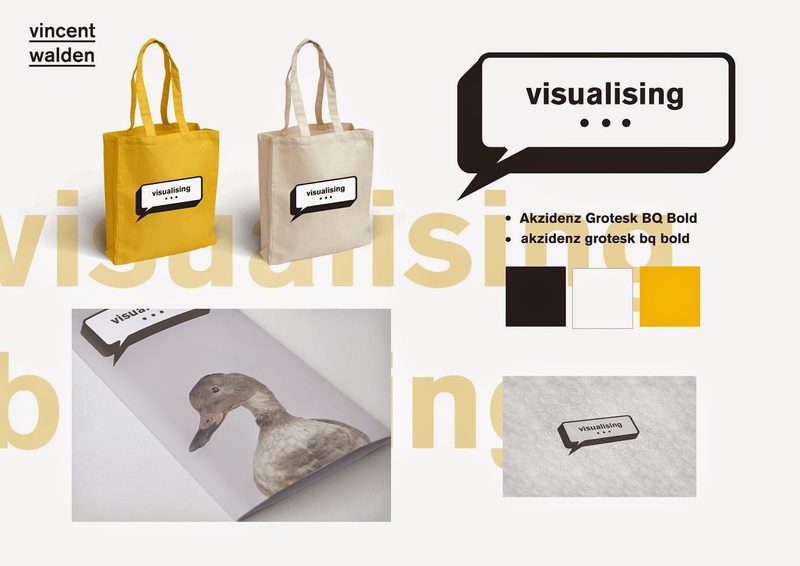 Today we showed our ideas for the Visualising section of this (the photography conference) and unfortunately they weren't overly keen on my ideas—though my buddy James Reay is in the final chosen three, so good luck to him! 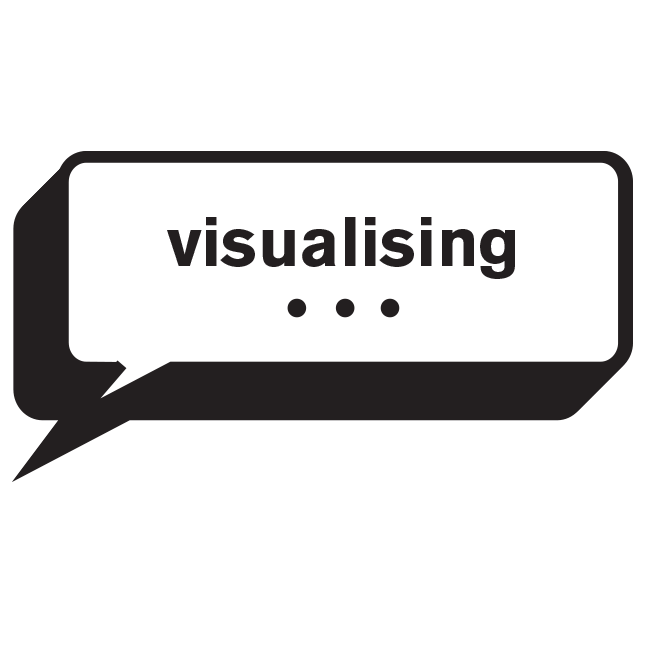 The idea I had for this logo to represent the idea of speech, as the whole idea of the conference is that it's focused more on the theory of photography. I used the speech bubble as an obvious cue to the idea of speech and reinforced that with the ellipsis as any time you see that glyph it makes you aware that more words are due to come. I made the logo, just a simple monochrome so that when over-layed over any image (for promotional purposes) it would be able to stand out as it isolates itself. Above are the two A3 sheets I handed over as my attempt to win the chance to use my branding. 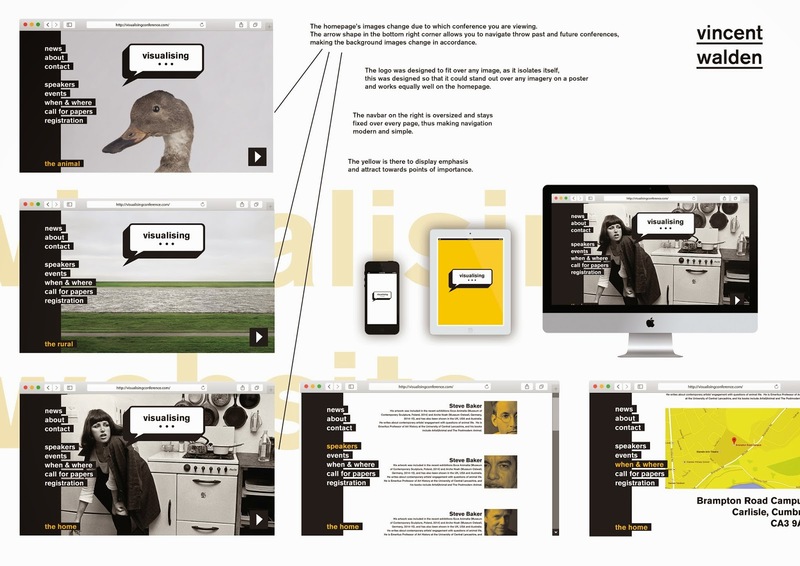 I added a third colour of a chrome yellow as I feel it helped bring attention to significant sections and information and dragged the branding out of the closed book of exclusive monochrome. I really like the branding that I made, and had a lot of fun making a sort of lo-fi modern approach; and it only made it sweeter that Sir Dave, Lord of Technology And Films You Never Heard Of said he liked my logo a lot. Thanks Dave, you're a babe. So, I even made a website and they didn't choose me—even though everyone else did too. Well now I'm going to be a sore loser, hate you all! Well not really, just you Rachael. Just you alone. No reason, just hatred. To incorrectly quote A Tribe Called Quest – Everything is better when you are living in the centre, or being middle class. So when we were set the brief of designing a fictional magazine for our editorial brief of the second year and I fancied picking fun at the middle class and partly myself. I decided that I wanted to make a satirical problem magazine for the middle class; covering troublesome issues such as Hummus, HSBC and Flushable Wet Wipes. I made the publication that faded 'salmon pink' that is upheld on the paper for the Financial Times to give it that "Yes look at me, I understand economics and I'm clearly more clever than you, because my newspaper is pink" but pastiche it and make it a trashy and repulsively boring one at that – with a hint of good design. I used the blue as a contrast colour to the pink to give it a modern feel and unlike that 'decline of modern language & journalism' publications, I've used only two professional font families, a strong colour pallet and no words that were made up by the atrocity that is Joey Essex. It was really fun to do and I love the idea of filling a magazine with a load of crap, but because it's such a high priced pile of crap, I could put a hairy arse crack over a double page spread—of which I need to thank the helpful (and seriously hairy) wildlife student friends I have, mostly you Bambi. I have taken a lot of inspiration from my favourite era of editorial design—the early 60's. I feel this shows through and it wouldn't be fair not to credit whomever was the artistic director for Design magazine from 1960 – 1964 as you have influenced me greatly. Loose, like a noose on the roof. Yeah the title has nothing to do with the contents of this post; wanna' fight about it!? 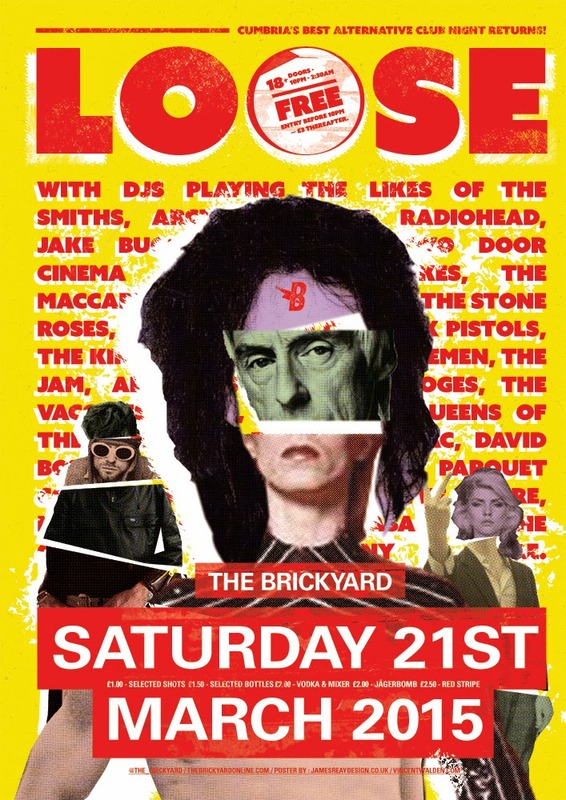 I was more than happy to do that but I had the idea of changing that up and make it stand out as a local bar had adapted the exact idea and done a very basic (and not as well designed) rip off of the old poster. I thought about it a bit and came to conclusion I had a friend that would be rather good at helping me with this, and not only that be he is my personal music tutor but he also is super keen about indie music, so he'd be a massive help with this poster and the pair of us working on this would be an interesting idea. His name is James and you'll likely know him if you know myself. He is the unmissable, northern, ginger shining beacon of musical knowledge embodied in a punk t-shirt and a Primark fleece. We had a blast of ideas and came to the idea that we'd both like to work away from a simple collage, or anything that looked too much like the 'Sgt. Peppers' album sleeve. We went through a tonne of test and ideas, getting inspiration from Terry Gillian, and collages from around the world; until we got to the final idea. The idea of instead of making a wall of famous faces, that we would make an ultimate indie star by mixing body parts of musicians and famous faces alike. With this poster we encountered a range of issues, and it sadly made the design of the poster take a lot longer than needed. We could never really agree of the final outcome and because we had different styles it proved very difficult to mix them. We also found it hard to make space and fit all the items in, in a way which suited the both of us. It was a very good project to work on together and I do feel the final outcome, does reflect the odd and indie mantra that we were trying to put across but I feel that because we found it so hard to mix out two ideas and styles that it wasn't the strongest that I could design alone, and it also isn't as strong as what James could design alone. In no way, do I regret working with James on this, but because we are polar opposites in production but similar with ideas, it proved as a big learning curve. I like a lot of choices we made and the processes we went through but I also feel that I ended doing more of the final piece than James, which is both slightly unfair on him and a testiment that I personally feel we work well together on something we can spread both our ideas over (see A conservative way to have fun) but in the enclosed space of a poster we may just be best advising each other than working directly together. Return of the Jedi; Or just a northern boy. I haven't posted in ages and I will shortly resume to posting at a good rate, this is due to moving and the loss of internet due to that. Expect random crap very soon! 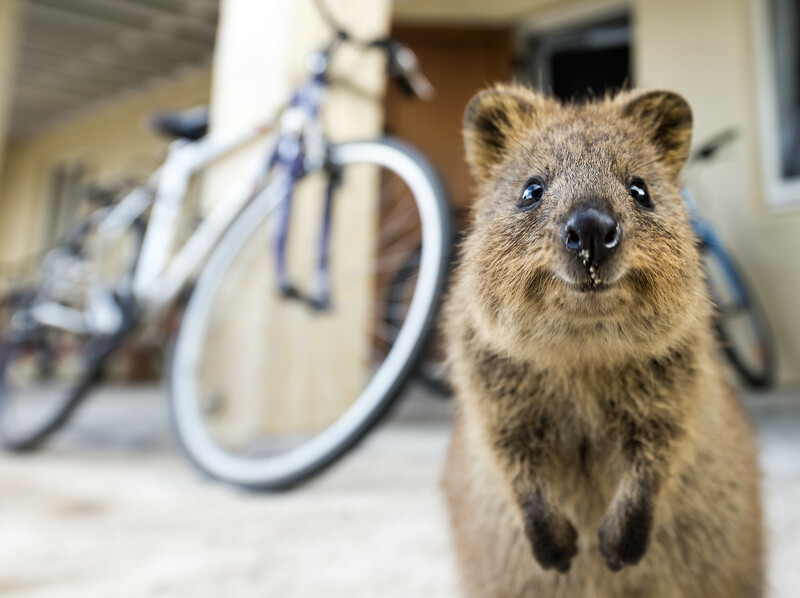 As always, for the best filler image—here's a Quokka!